Sandoval County Master Gardeners are committed to providing the public with the latest, most practical horticultural information currently available. Projects that provide information to the public fall into the following categories: answering gardening questions by phone or email; answering gardening questions in person; and offering education/training classes to the public. 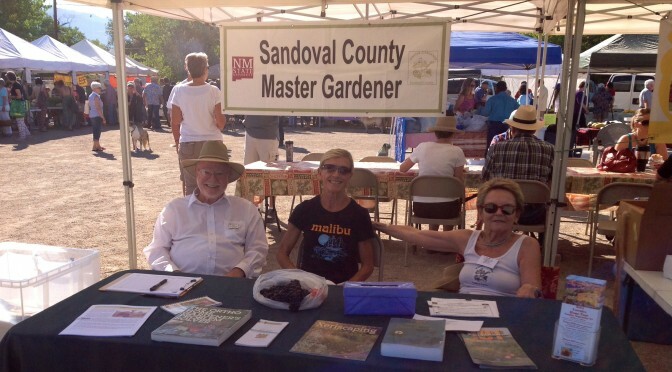 Sandoval County Master Gardeners participate in a number of annual community events. To be successful each of these events requires a number of master gardeners. Check with the project chair for details and check the calendar for the exact day. This two-day festival is held the last weekend in September and features a range of activities at the Casa San Ysidro Museum (973 Old Church Road) and the Village Town Hall area (4324 Corrales Road). The SCMG have two separate tables at that Harvest Festival – one features activities for youth and is located at the Casa San Ysidro Museum and the other is an information table in the Village Town Hall area. Project leaders for Harvest Festival are Gretchen Neiman and Cathy Elliot. This is a spring celebration of the history of the Village of Corrales held in mid-May. The SCMG have a table at the Casa San Ysidro Museum (973 Old Church Road) across from the Old Church. Activities at the SCMG table include distributing new world seeds to youth and helping them to plant them and create a mini-greenhouse to take home. Chair of this project is Lifetime Master Gardener Therese Barts. This two-day event is intended to provide water education to fourth grade students in Rio Rancho. This festival is held in September. For more information contact project chair Pat Barger. Earth Day is in April and the city of Rio Rancho celebrates the day with an expo featuring information on energy efficiency, green practices and sustainable living. The Sandoval County Master Gardeners have an information table at the event to distribute gardening information and answer questions. Sandoval County Master Gardeners help judge student work in a variety of categories including Biology and Biochemistry, Environmental and Earth Sciences and Behavioral and Social Sciences among others. The Research Expo is typically held in January and for more information contact project chair Pat Barger. The Xeriscape Conference is a two-day event held in the winter and featuring a variety of lectures and exhibitor expo on topics related to waterwise living in the desert. Sandoval County Master Gardeners have an information table at the event to distribute gardening information and answer questions. Contact project chair Suzanne Maxwell for more information.